An ebleskiver (pronounced "able-skeever") is a traditional Danish pancake in the shape of a sphere. It's solid like a pancake, but light and fluffy like a popover. These airy treats are often served with a dusting of powdered sugar and accompanied by a fruit jam. Ebelskivers can be sweet or savory, filled or unfilled, feature fresh fruit, vegetables, cheese, preserves, chocolate, and more. The possibility for fillings is endless. These heavenly puffs can be served as a delightful breakfast, an innovative hor d’oeuvre, as a satisfying light supper or a delectable dessert. Try something different this year at your Superbowl party. Instead of the standard football fare of chips and salsa, treat your guests to a more unique appetizer. These ebelskivers are also great served with Jakes Vegetarian Chili. Preheat the over too 200 degrees. In a large bowl, whisk together the flour, cornmeal, sugar, baking powder and salt. Set aside. In a small bowl, lightly whisk the egg yolk, then whisk in the milk and 2 tablespoons of the melted butter. Add the yolk mixture to the flour mixture and, and using a wooden spoon, stir until well blended. The batter will be slightly lumpy. In a clean bowl, using an electric mixer set on high speed, beat the egg whites until stiff (but not dry) peaks form. Fold one-third of the egg whites into the batter to lighten it, then fold in the rest and gently blend until no white streaks remain. Carefully fold in the green onion, jalepeno, cheese, and corn kernels, taking care not to deflate the mixture. Brush the wells of the ebelskiver pan with some of the remaining butter and place over low-medium heat. When the butter starts to bubble, add about 2 tablespoons batter to each well. Cook until the bottoms of the pancake are lightly browned and crisp, 3-5 minutes. Use two bamboo skewers to turn the pancakes and cook until lightly browned on the second side, about 3 minutes longer. Transfer the finished pancakes to a platter and keep warm in the oven while you repeat to make two more batches. Can be made ahead of time and re-warmed in the oven. Serve with Tomatillo Salsa Verde. Remove papery husks from tomatillos and rinse well to remove stickiness. Roast tomatillo in whichever method you prefer. I like to roast them over a flame on the burner, it's fun to hear them sizzle and pop. Using tongs rotate the tomatillos on the flame until they are blackened and blistered all around. Roast the poblano in the same fashion. Once the poblano has cooled slightly, remove all the burnt skin and chop (keep the burnt skins on the whole tomatillos). 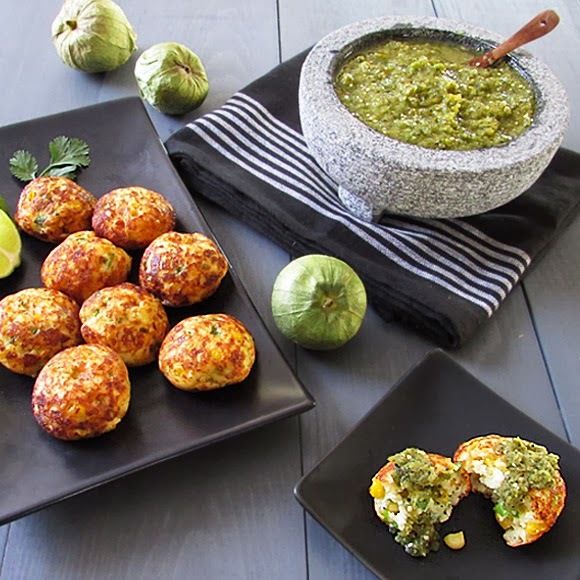 Place whole tomatillos, onions and jalapeno into a food processor or high powered blender and pulse. Add in remaining ingredients and pulse until desired consistency.